It has been said that "an ounce of prevention is worth a pound of cure". For pet owners preparing to travel by plane or car, a few ounces of preparation and time will prevent future heartaches and frustrations on the trip. First, make sure that your pet has proper identification on him or her at all times. This can be something as simple as an ID tag on his collar, but a more permanent solution would be the use of an implantable microchip. Next, make sure you have copies of vaccination records and needed medications easily accessible during the trip. You might even ask your family veterinarian for a recommendation of an emergency hospital near your destination. And finally, do your homework. Some airlines and travel sites may require a health certificate for your pet. This document must be dated within 10 days of the start of your travels. For pets who will be flying with their owners, good communication with the airlines is a must. In all cases, your four legged friend needs to be over 8 weeks old and weaned for at least 5 days. Most airlines will require the above mentioned health certificate and all recommend arriving at the airport early to insure the smooth check-in of your pet. Kennels that will be checked into the cargo area must be non-collapsible, large enough to allow the pet to stand and have a leak-proof bottom covered with absorbent material. Be sure to check the weather at home and at your destination. Some specific breeds and individual pets may not do well, especially during the warmer temperatures of summer. Airlines may refuse to transport pets if the temperature exceeds 85 degrees in the cargo hold or is less than 45 degrees anywhere along the itinerary. American Airlines, for example, requires a veterinarian's statement that the pet is acclimated to cold weather if the temperature drops below 45 degrees. Traveling by car may be less complex than air travel, but due to the longer time frames, owners need to plan rest stops and exercise times for their animal companions. The AVMA recommends that you keep a jug of fresh water in the car to avoid times when reliable water sources may not be available. Pets will travel better with small amounts of food and water in their system frequently rather than allowing the pet to eat his or her normal ration. 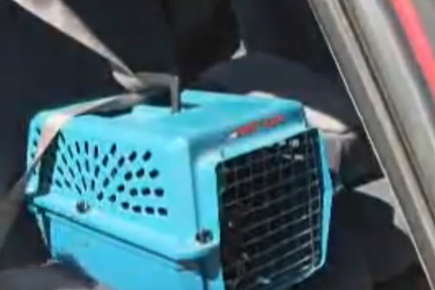 Cats should be kept in carriers or cages during travel to avoid potential accidents if the pet gets "underfoot" of the driver. When you reach your destination, be sure that you are aware of pet-friendly hotels and campsites in the area. Also, veterinary and animal experts recommend owners to be "considerate" and have a kennel or crate available. There are many sites online that can help you find lodging that allow pets. At www.petswelcome.com, over 25,000 hotels and other locations that allow pets are listed. For owners who will be camping with their dogs, veterinarians recommend the application of a topical flea and tick preventative to help avoid bringing home any unwanted guests.